See how the newly enhanced visuals compare to the original's in this new trailer for The Walking Dead Collection, which gathers all 19 episodes in the critically-acclaimed series onto a single disc for the first time. A new trailer for The Walking Dead: The Telltale Series Collection that contains never-before-seen footage of the collection's enhanced visuals in action. The trailer also contains footage from the original version of the same scene, allowing viewers to directly compare the updated visuals against the original graphics. 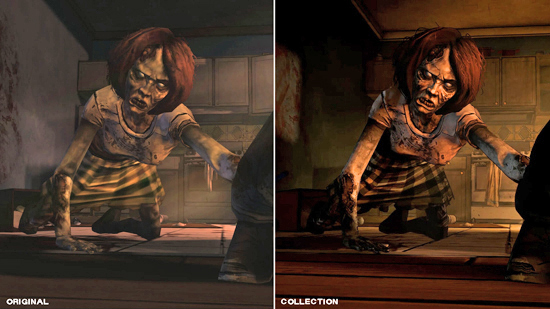 For more information on the collection's visual improvements, please see Telltale's most recent developer blog, which details the specific actions undertaken to achieve this substantial visual upgrade. The Walking Dead Collection will arrive in stores on December 5th at retailers across North America and Europe, gathering all 19 episodes in the award-winning series onto one disc for PlayStation 4 and Xbox One. The collection will also be available digitally on both platforms starting that same day. The collection includes the recent third season, The Walking Dead: A New Frontier, as well as visually enhanced versions of Season One, Season Two, 400 Days, and the three-part Michonne mini-series. The Walking Dead is an unparalleled journey into the heart of what it means to be human in a world that's lost its humanity. Set in Robert Kirkman's award-winning comic book universe, your story is determined by the choices you make. 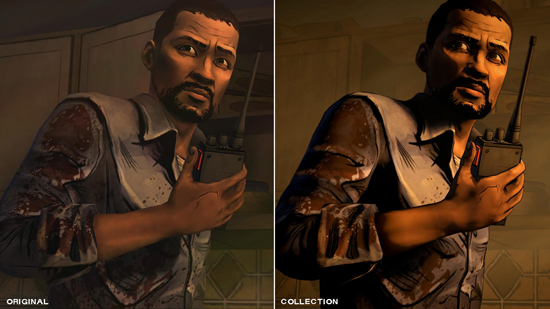 Season One of The Walking Dead: A Telltale Series redefined expectations for storytelling in video games, winning over 100 Game of the Year awards. Now the first three seasons, as well as horror anthology 400 Days and the three-part mini-series starring blade-wielding icon Michonne, will be available in one place for the first time, allowing you to prepare for the upcoming fourth and final season starring beloved survivor Clementine (due out in 2018).